This course trains divers in the knowledge and skills needed to manage risks and effectively handle limited in-water problems and diving emergencies. 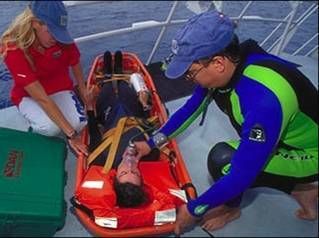 Included are: assists, transports, surface rescues and rescues from depth involving both boat and shore based skin and scuba divers. This course meets the prerequisite rescue training for leadership certification. The course begins with a 194 page full color textbook, workbook and DVD video for home study, then continues with a weekend of training consisting of one classroom session, one beach session and one dive boat session. Course tuition is $395.00, which includes the textbook, workbook, and DVD, tanks and air for the beach, and NAUI Rescue SCUBA Diver or NAUI Advanced Rescue SCUBA Diver certification upon successful completion. Dive boat charter fees and rental equipment are not included. To enroll, email Enroll@ScubaConn.com or call 203-952-8679. Scuba Rescue Diver training moves you on your pathway to diving leadership courses (Divemaster or Instructor)!